Loutraki passenger and car ferry ticket prices, timetables, ticket reservations and information for ferries sailing from Loutraki to Volos and Skiathos. Compare all available Loutraki ferry ticket prices in real time and book the cheapest available Loutraki car and passenger ferry tickets sailing to and from Loutraki, Volos and Skiathos with Sea Jets ferries online with instant confirmation. Book Loutraki Ferry Tickets with Sea Jets for ferries sailing from Loutraki to Volos and Skiathos online in advance to enjoy the cheapest available ferry ticket price. The price you see is the price you pay. There are no hidden extras or surprises such as added fuel surcharges or booking fees and we do not charge you anything extra for paying with a Visa Electron card. The price we quote you for your selected Loutraki passenger or car ferry ticket, onboard accommodation and vehicle type is all you will pay, and that's a promise. To obtain a Loutraki ferry ticket price and book your ferry ticket securely online please use the real time ferry booking form on the left. You are also able to add a hotel at your destination, or anywhere else, to your ferry ticket when completing your ferry ticket reservation. Loutraki is the second largest port on the island of Skopelos and many of the inter-island ferries call here. As such, Loutraki is the first place that many international visitors will see. The hydrofoils from Skiathos call here before sailing around the island to Skopelos Town (Hora). There is a pebble beach at Loutraki which also serves as the main beach for the inhabitants of nearby Glossa. This west facing beach is a good place to spend an afternoon soaking up the sun before watching it set beyond neighbouring Skiathos. For those seeking seclusion, it is possible to find coves along the coast from Loutraki, particularly to the south of the village. Unlike Glossa, which is perched on the hill behind, Loutraki is much better geared up for international tourists and visitors. However, Loutraki does not have the same rustic charm as it's elevated neighbour. Loutraki is connected to Athens by land and by rail (80 Km) and can be connected by sea to Piraeus (Isthmus) and Patras, that is, to the country’s principal entrance spots. A unique combination of climatological conditions and natural surroundings makes Loutraki a privileged place. A temperate Mediterranean climate, breezes scented with iodine from the crystalline sea, superb beaches which have received four "Blue Flags of Europe " awards, and the oxygen-laden air brought down by the benevolent north wind as it blows through the fir forests of Mt. Gerania are some of its assets. Its prolonged sunshine throughout the year and lack of humidity are particularly favorable for health tourism and for natural post- treatment recovery. Facilities for holidaymakers at Loutraki are particularly well developed, since the place has traditonally been linked with health tourism and hot baths for so long. There are 57 hotels of all categories and a host of pensions and furnished flats ready to welcome the thousands of visitors who arrive to the famous spa year round and especially in summer. Proper diet is guaranteed thanks to the numerous good restaurants and taverns serving delicious fresh fish and anything else one might desire. Devotees of water sports discover that Loutraki is a paradise with ideal conditions for swimming, wind surfing and fishing. There are also abundant tennis courts, basketball and volleyball courts, and soccer fields, completing the possibilities for naturally healthy vacations combined with exercise. Limitless opportunities exist for entertainment and shopping. A wealth of shops, boutiques, jewellry stores, art galleries, cinemas, discos, bars and night clubs exists, offering something for all ages and inclinations. Dozens of concerts, theatrical performances and happenings lend a quality of another sort to a Loutraki holiday. The Municipal Bands, the drum majorettes, the appearances of music groups and well known performers, both Greek and foreign, the many art exhibitions, the fun-filled fiestas, all make the holiday maker's life more colorful and entertaining. In these lively surroundings, rehabilitation and post-therapy recovery take place in the pleasant, most creative and rewarding way. Loutraki is an extraordinarily vital place and holidays take the form of an unforgettable exciting experience, for both children and adults. Loutraki's ideal location, a unique blend of the cleanest of seas and delightful coves with mountain scenery, fir forests and lush vegetation that grows right down to the water's edge, offers innumerable possibilibes for short trips around the Greek countryside. For those who worship the sea there are many untouched beaches reachable by boat. For those who love the heights, the Gerania range is close enough for romantic strolls and more energetic mountain hikes. Loutraki is also beautifully positioned for excursions to some of Greece's most important archaeological sites, such as Ancient Corinth, Delphi, Mycenae, Epidavros, Olympia and the Acropolis in Athens. Temples and Byzantine churches lie within a short distance of town; these include the Heraion on exquisite lake Vouliagmeni and the monasteries nestled in the mountains. Best Price Guarantee - We always offer you our lowest available Sea Jets passenger and car ferries ticket price to and from Loutraki. There are no hidden extras or surprises such as added fuel surcharges or booking fees and we also we do not charge you anything extra for paying with a Visa Electron card. The price we quote for your selected Loutraki ferry ticket, onboard accommodation and vehicle type is all you will pay, and that's a promise! In the unlikely event you find the same all inclusive Loutraki ferry ticket cheaper in the brochure of any other tour operator we promise that we will do our best to beat that price or offer you the choice of requesting a refund. 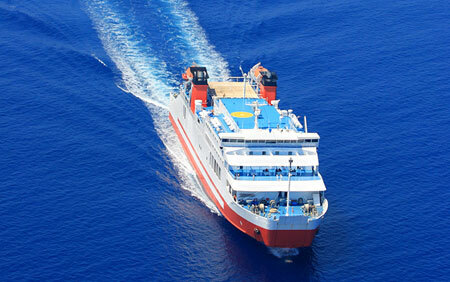 To book Loutraki car and passenger ferry tickets please click here. At ferryto.co.uk you are able to obtain live Loutraki ferry ticket prices, check availability and book car and passenger ferry tickets to and from Loutraki at our lowest available ticket price. Ferryto.co.uk is part of the world's largest online ferry ticket distribution network providing the ability to book over 80 major European ferry operators including to Loutraki and to over 1,200 other ferry routes throughout the UK, France, Spain, Ireland, Holland, Eastern Europe, the Mediterranean, the Baltic and North Africa.